Discount codes for you Online Shoppers! / IISJONG | Singapore-Australia Lifestyle & Travel Blog IISJONG | Singapore-Australia Lifestyle & Travel Blog: Discount codes for you Online Shoppers! Discount codes for you Online Shoppers! If any of the store owners or in-charge listed below feels uncomfortable about this, do e-mail me at contactiisjong@gmail.com and I'll have it removed immediately! Valid at Parco Next Next Flagship store. $10 gift voucher, min. purchase $50. Not applicable to accessories and discounted items. Valid till 31 December 2012. E-mail me for details. 10% off everything online. Valid till 31 August 2012. Quote "GET10". Valid at Far East Plaza. 20% off haircut and all Chemical Services, 50% off all Second Chemical Service. Terms and Conditions apply. E-mail me for details. Valid at 141 Jalan Besar. $20 voucher. Expires 31 October 2012. E-mail me for details. 10% off storewide. Only valid for purchases above 2 items. Expires 31 August 2012. Quote "EZxST10". $5 off, no min. purchase. Free local postage. Valid till 31 August 2012. Quote "FIVEOFF". $15 Cash Voucher. E-mail me for details. 10% off all regular priced items. Expires 31 August 2012. Quote "ILOVEFEISTHEIST". $15 off min. purchase $60. Expires 31 August 2012. Only for regular-priced items. Quote "ST15OFF". Valid at Glitter Glam shops. $10 Voucher. Minimum spending of $50 is required. Expires 31 October 2012. E-mail me for details. 50% discount. Expires 31 December 2012. Quote "HJSPH50". Valid at Luxe Women stores. $5 Discount all nailart services & treatments. FREE membership. E-mail me for details. 15% off all apparels purchase. Not valid for sale item(s) or any other discount(s)/promotion(s). Valid till 31 October 2012. Quote "MGPX15OF". $2 voucher. Expires 1 October 2012. Quote "MMT2FM". $50 Shopping Voucher with min.purchase of $120 in one receipt. Valid until 31 October 2012. E-mail me for details. $10 voucher with a min. purchase of $50. Expires 31 October 2012. Not valid for sales items. Quote "STMONT10". $100 voucher with min. purchase of $1000. Expires 31 August 2012. E-mail me for details. $100 voucher with min. purchase of $150. Expires end January 2013. 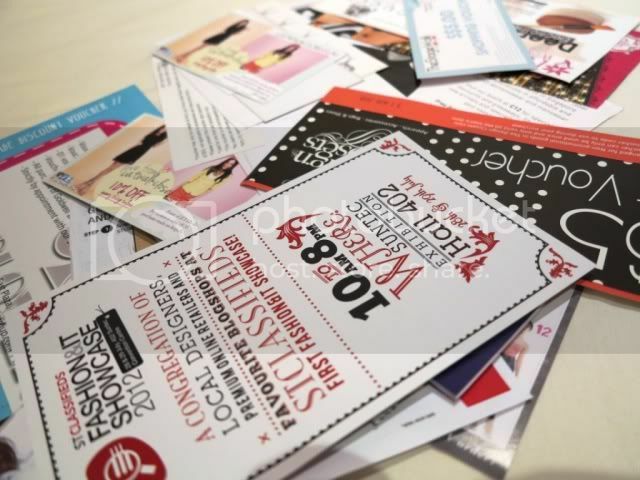 Quote "ST Fashion & IT Showcase Voucher". 10% off. Limited to one person only, so first come first serve. Quote "STC12". $5 gift voucher for non-promotional goods. Valid till 31 August 2012. E-mail me for details. 10% off total. Does not include postage rates. This code can only be used once, first come first serve. Expires 31 August 2012. Quote "STCTSR201210". $5 Shopping Voucher. Only be used on full-price merchandise. Valid till 31 August 2012. E-mail me for details. $20 off with min. purchase of $50. Expires 25 August 2012. Quote "STCLASSVIPLcr". I really appreciate you for providing complete information at one place. Internet is just work like a multi-solution system for human being. And no doubt it has the great ability to provide the best kind solution for many problems. Today we can do clothes shopping online sitting in comfort of our own home. It was a great opportunity for me. I have missed the 50% discount offer on jewellery. I hope to see your next update soon.